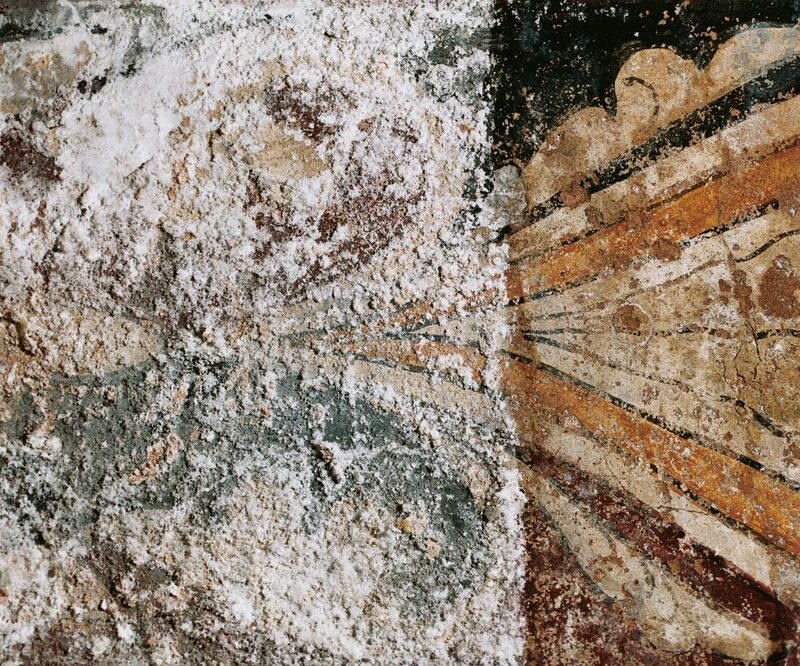 The upper image shows a detail of the surface condition of the 15th-century wall painting of the Warning to the Sabbath-Breakers, prior to investigation and remedial treatment. A liquid moisture survey was carried out to indicate how the fabric of the building was functioning (funded by the Council for the Care of Churches). This showed that the deterioration was ongoing and was being caused by penetrating damp from faults in an overloaded and badly positioned rainwater disposal system. Determination of the causes of ongoing deterioration by means of diagnostic investigations, such as environmental assessments involving liquid moisture surveys, allows formulation of passive and preventative measures to control active decay and inform proposals for remedial treatments.